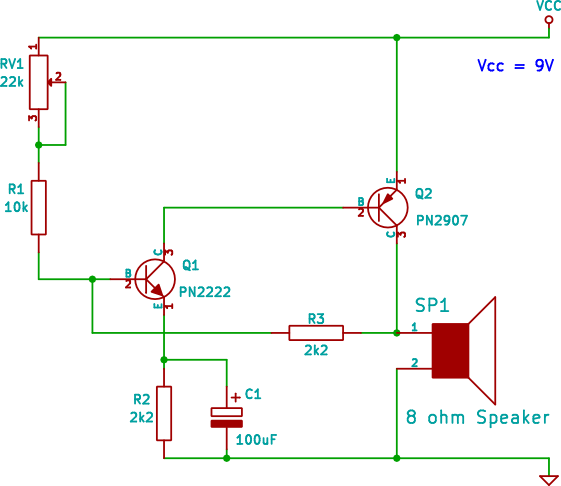 An easy to build two transistor metronome circuit that gives a periodic tick sound. The frequency of the tick can be adjusted using a potentiometer. An easy to build circuit for beginners in electronics. A metronome is typically used by musicians when practising in order to play in time to a particular beat. This video shows the metronome operating and the tick speed being adjusted using the potentiometer. The two transistor metronome circuit shown here can be powered by a 9V battery. The frequency of the tick is changed using potentiometer RV1. The lower the resistance set on the potentiometer, the faster the metronome will tick. Resistor R1 is used to set the maximum speed that the metronome will tick at. Change the R1 and VR1 values to change the speed or frequency range that the metronome operates over. The speaker and battery clip have single core wire soldered to them to make them easy to plug into the breadboard.